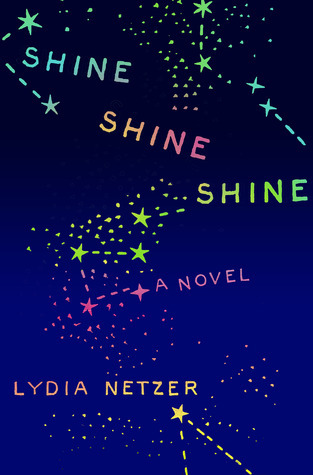 Shine Shine Shine by Lydia Netzer is one of a kind. That’s one of the things I look for in a book. Have I read this story before? It seems like we often read the same thing over and over again, but I never got that feeling with this book. And I enjoyed it from beginning to end, even if I didn’t fully understand the characters’ motivations. That’s okay; we often don’t understand our own motivation, much less other people’s. The main character, Sunny, is under a lot of stress, to put it mildly. Her husband, Maxon, a brilliant robotics engineer is in a rocket on his way to the moon. Her mother, Emma, who gave birth to Sunny under very difficult circumstances in Burma, is dying of cancer. Her son, Bubber, is autistic and is often a handful; Sunny is pregnant again, but not sure she’s fit to be a mother; and is confronted with her own medical condition, alopecia–never named in the book, but it’s a condition of hairlessness–when her wig flies off during a traffic accident. So you’ll forgive Sunny if she behaves somewhat badly. It’s no surprise that this book is being praised and was just named a finalist for the LA Times First Fiction Award. And I’m thrilled to say that I am on a panel with the author next month at the Virginia Festival of the Book. I’m looking forward to hearing her talk about her book.